The University of Louisiana at Lafayette is sizing up its housing options – both present and future. The university received approval to request proposals that would outline the best strategic plan for renovating and/or replacing dormitories. Specifically, the university is seeking a comprehensive, on-campus housing assessment including existing residential facilities and associated buildings and grounds. These proposals would be master residential plans for the renovation of existing residence halls and the construction of new housing halls. The university is seeking to house up to 5,000 students, graduate students, faculty, staff and their families. “The proposals will consider which dorms need to be demolished, which need renovations and also the construction of new halls. They will give an overall plan for housing on campus,” said Edward Pratt, interim vice president for Student Affairs. Approximately 1,565 students currently live on campus. That’s just shy of the maximum number of 1,700 beds available. 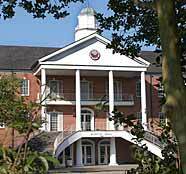 Traditional residence halls include Baker-Huger, Bonin, Evangeline, Harris and Randolph for female students and the Conference Center and Stokes Hall for male students. Legacy Park, apartment-style housing, is the newest option for students living on campus. According to Housing Director Lisa Landry, a waiting list for Legacy Park is typical at the start of each fall semester. Over the past two years, all of the current residence halls received minor renovations including new ceiling tiles and new paint both inside and outside. Baker-Huger received a new roof and Bonin Hall bathrooms were totally renovated two years ago as well. And last year, the fourth floor of the Conference Center was renovated with the third floor being renovated now. Proposals will be opened on Jan. 12, 2010.